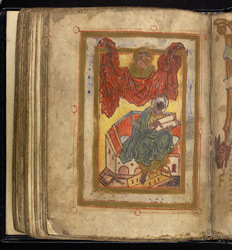 The portrait of the evangelist John, preceding his gospel, was painted by the 10th-century artist on a separate leaf and inserted into the book. Above him, his symbol, the eagle, is visible behind an open book. The style of the picture comes from Continental sources. Its illusion of three-dimensional mass and space along with its naturalism and rich palette come ultimately from Carolingian art. The energetic lines and layered painting technique are seen in later Anglo-Saxon painting. Some of the pigments were unstable and have decayed to an unflattering dark grey.